A good weather window was shaping up for the long weekend east of the crest that I wanted to take advantage of. The snow conditions weren’t predicted to be great, but I figured out routes up Star and Courtney Peaks that avoided avy terrain and were quite safe. I couldn’t find a partner, so planned to go solo. Saturday evening I drove out of Seattle and arrived at the Twisp River Sno Park around 8pm. I soon went to sleep in the car with my alarm set for 3am. I knew it was going to be a long day and wanted an early start. Previously when I had climbed Oval Peak in Feb 2017, near Star and Courtney, it had taken 12 hours to get to base camp. That was with a partner to help break trail, and travelling on skis. 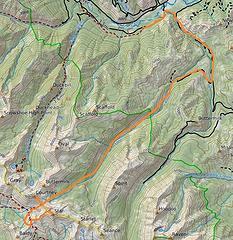 This time I would be breaking trail completely by myself and would be going much farther into the wilderness. 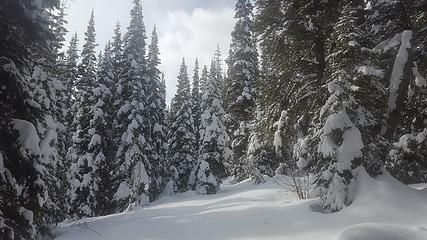 I also planned to ski only to the end of the road, then continue on snowshoes once I hit trail. 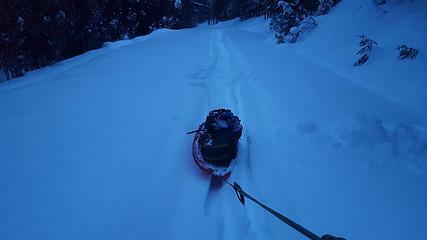 It’s much safer going solo to be on snowshoes because they force you to move slower. Thus there’s less risk of getting injured. Because the first 9 miles were on road I planned to pull my gear in a sled. 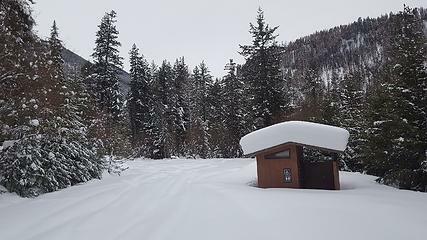 I would then ditch the sled at the trailhead along with my skis and ski boots. By 3:30am I was packed up and towing my sled. I skinned up to the end of the plowed road after half an hour and saw a car parked right there. It was where I wished I could have parked, but was next to a conspicuous “No Parking – Snow Plow Turnaround” sign. Past the car the road was luckily packed down by snowmobiles. Last time I’d come here in winter I had to break trail from this point, so hopefully I could move a bit faster this time. Progress was smooth under the bright moon, and I lucked out again that the snowmobile tracks continued on the turnoff road 43-500. However, 2 miles before the trailhead, just as it was starting to get light out, the tracks ended. Here I had to start breaking trail on my own and discovered just how deep and powdery the snow was. I was sinking in so deep that the sled I was towing would not stay upright. It kept tipping into my tracks and flipping over. I’ve never had this problem before. I have a mountaineering partner who names his expedition sled “Paco” and scolds it like a disobedient dog whenever it misbehaves like that. I felt like scolding my sled too, but that wouldn’t have done much good. I finally figured out that if I held the rope for the sled out to my side and pulled with my arm, it would stay out of my tracks and not tip over. It was tiring, but eventually by 8am I reached the trailhead and took a break. There I switched into my mountaineering boots and snowshoes, hid the sled, skis, and ski boots in the woods, and soon started up the trail. It was definitely helpful that I had been on this trail in the winter and summer, because it wasn’t always obvious where it went. With my memory and a GPS route on my phone I made consistent progress. However, the progress was slow. I was sinking up to my upper shin with every step, even wearing the biggest snowshoes I could find. There were also quite a few blowdowns on the trail, likely from the fire last summer. This area was closed from August til November, and in fact there was still a “Trail Closed” sign at the trailhead. It was buried so deep in the snow, though, that if any ranger asked I’d say I didn’t see it. Most of the trees had burn marks on the bottom, but as I got farther up the valley the evidence of the fire diminished and the forest looked normal. I plodded along for 2 hours, then stopped to check my GPS. It looked like I’d gone about a quarter of the way to Fish Creek Pass, which meant I was moving at about 1 mile per hour. If I kept up that pace I could get there before sunset, which was my goal. As I broke trail farther I noticed my energy got zapped at higher and higher frequency. In the morning I went four hours before my first break, then two hours, then every hour. That day would be one of the highest-calorie days in recent memory for sure. I eventually passed the turnoff point I’d taken in Feb 2016 for the Oval Peak base camp, and continued on in uncharted territory. 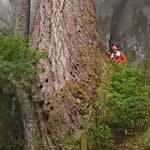 The trail remained difficult until I soon started getting glimpses of Courtney and Star through the trees. 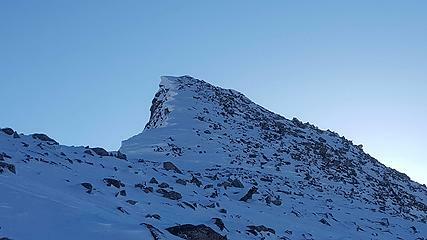 Star looked impossibly steep with huge cornices hanging off the top. Luckily my route would come up the easier back side. By 4:30pm I reached Fish Creek Pass and was met with an amazing view of the Cascades spread out to the west. Cresting a pass is definitely my favorite part of climbing mountains because the views materialize so suddenly. There wasn’t much daylight left so I dropped my pack, stuffed some chocolate chips in my pocket, and started up Courtney to the north. It was about a 900ft climb and I was confident I could get up there by sunset. 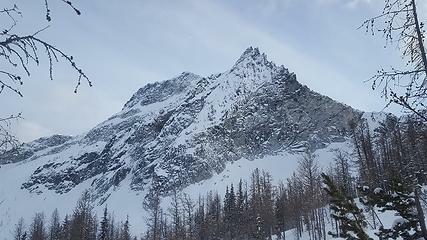 The ridge was wind scoured with patches of icy snow and occasional bushes and rocks poking out. As I got higher I regretted not switching to crampons, and unfortunately had to scramble over boulders in my snowshoes. Nothing broke, though. By 5pm I crested the summit and amazingly there was zero wind. It was still very cold (probably single digits). I hung out for 20 minutes as the clouds turned orange to the west and pink to the east. 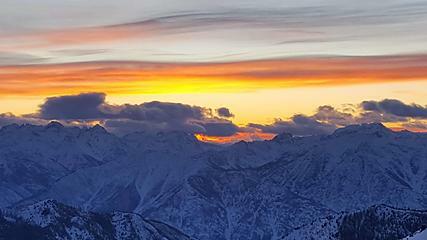 It’s hard to beat a winter sunset from the top of an 8,000ft peak in the Cascades. I then hustled back down to my pack, hiked down to Star Lake, and set up camp. The weather forecast was for a low of 2F at the lake that night, and it certainly felt cold. I boiled two liters of water to put inside the sleeping bag and that helped quite a bit. 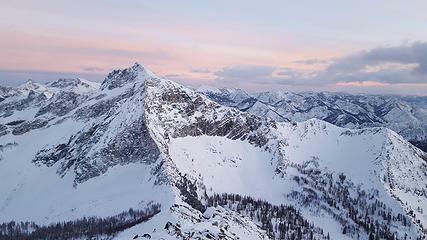 I set my alarm for 4am the next morning, planning to get up Star Peak for sunrise. But it was not hard to come up with excuses to sleep in when the alarm actually went off and it actually 4am, 2F outside, and the sleeping bag was still warm inside. My excuse was that it would be miserable to be above treeline in the dark when it was below zero up there. By 5am I started suiting up and was hiking by 5:30am. The normal summer route goes up an avy slope, so I instead descended to the southwest where I could gain the southwest ridge of Star Peak at a low-angle tree-covered slope that was much safer. I crested the edge of the trees on the ridge around sunrise, then followed the ridge up. It was icy and I was glad my snowshoes had teeth along the rim. As I got higher the snow cover got thinner until I eventually ditched the snowshoes and proceeded in crampons. By 8:30am I scrambled the last snowy boulder to the summit, being careful not to get too close to the monster cornices overhanging the north face. It was neat to see the sun first hitting the mountains to the west. While it was sunny overhead, I noticed big clouds pummeling Bonanza and Goode across Lake Chelan. It was very cold, likely below zero, and windy. I think I stayed for just 5 minutes on that summit before I was loosing feeling in my fingers and needed to get moving. 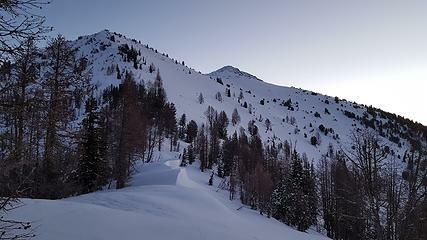 I scrambled back down the ridge, and by the time I reached my snowshoes I had warmed back up again. I hiked back down the ridge and back to camp by 10:00am. By then it started snowing lightly and star peak was socked in the clouds. The forecast for the day had been mostly sunny, but I guess mountain weather is tough to predict. I had drunk 2 liters of water already that morning, so melted another 2L of snow while I packed up. I was soon hiking back to Fish Creek Pass. Luckily I had had the foresight on the descent from the pass to camp to make low-angle switchbacks instead of plunging directly down. This meant I had an easy broken trail on the way back up. With one final look back at the view I descended down the east side of the pass at 11:15am. The rest of the trail would be cruise control. I wouldn’t have to pause to see where the gaps in the trees were that indicated a trail, or search around for cut logs. I even had a compacted path to follow. I moved pretty quickly, and checked my location after an hour. It now looked like I was moving at 3mph, three times as fast as on the ascent! I continued that pace and reached the trailhead a few hours later. By 3pm I had my boots in my pack, sled and snowshoes strapped on the back, and started skiing out. The terrain was rolling hills for the first 4 miles so I kept the skins on, but for the last 4 miles I took them off and skied down. Except for a few long flat sections that I had to skate ski I generally made pretty good time. By 5:15pm I was back at the car. After a pizza stop at the Twisp Chevron I made it back to Seattle late that night. 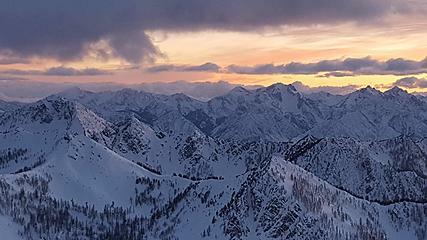 If you know of other winter ascents of these peaks I would be interested to hear about them! 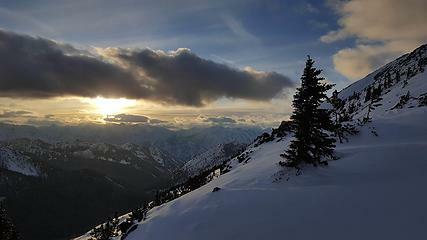 If you want to join for a future winter Bulger peak in the next month PM me. I’m always looking for partners. It's great to get a view into an area in the dead of winter that many of us only see in summer and fall. Thanks. Now that's an area you don't see many winter TRs from. Thanks for sharing! It's always reassuring when you come across cut logs when trying to follow a route in winter. I am impressed. Looks wonderful in winter!! I can't imagine how difficult all that solo trailbreaking must have been. Looks so beautiful there in winter. Nice effort! What an amazing effort and some beautiful pictures. I can’t imagine being able to function in such cold temperatures. What do you wear to stay warm? Great trip report! Very cool adventure. Wow, very impressive. Thanks for the rare big adventure report in the middle of winter. Wow you are a freak. I thought that approach trail was long and tedious enough in summer! I actually took the route you did up Star in the summer. I just studied the topo and picked the mellowest way up. I didn't even know there was a slight "trail" etched into the slope facing Star Lake until afterwards. Solo winter camping is a level of masochist and misery I will never obtain! I echo others--a pretty ballsy trip you'll probably remember for a long time. Great photos! You certainly earned them. Thanks for sharing them with us fainter-hearted armchair winter hikers. If you haven't looked at his website, I highly recommend it. Click on his name and then on the website link. I believe that everyone who has ever towed a "pig" ( sled) full of gear has wanted to curse it. I don't curse, but I sure felt like it! @#$%&!! Luckily I had had the foresight on the descent from the pass to camp to make low-angle switchbacks instead of plunging directly down. This meant I had an easy broken trail on the way back up. What a good idea! Most of us on far less ambitious adventures would likely just plunge on down the fall line, only to regret it later on the climb back up.